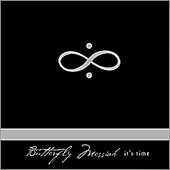 Butterfly Messiah's fourth release is limited to 1000 copies. "It's Time" is a Single/EP which contains five tracks altogether. The three versions of the title track include an instrumental, dance mix as well as the original. Butterfly Messiah is a Florida based band, with Shannon Garson (vocals, keyboards), Robert Davis (vocals, percussion, programming), and Job Harrington (keyboards, percussion, programming). This EP opens with "It's Time", a ready made club hit with multi-layered percussion, precision keyboards, and mesmerizing female vocals. The band shows its diversity with "Monument", an ethereal track with fusion of medieval elements. "Machine" is a beautiful example of classic darkwave, containing a melodic ethereal element with with a dark infusion of machine and pestilence, with both male and female vocals. Recommended for those who appreciate the ethereal elements of Dead Can Dance, and for fans of good darkwave such as Corvus Corax and Girls Under Glass.